As the weather heats up, so do home remodeling projects. Homeowners are looking to create efficiently designed kitchens to maintain an organized home. These top five trends are compelling homeowners to remodel their kitchens. 75% of homeowners say they are obsessed with decluttering their counters, according to a recent Houzz survey. This obsession is driving homeowners to remodel their kitchens for a fresh, clean design to ease their organizational woes. 75% of homeowners say they are obsessed with decluttering their counters, according to a recent Houzz survey. This obsession is driving homeowners to remodel their kitchens for a fresh, clean design to ease their organizational woes. These five trends are topping the charts as the most common updates in a kitchen. With an emphasis on kitchen organization, homeowners are looking for a clean look by using crisp whites and soft grays. These neutral paint colors add a level of sophistication and just a touch of modern appeal for a stunning kitchen. As homes get smaller, homeowners are getting smarter with their storage. According to a recent study by Wakefield Research, 58% of homeowners feel that every item has to be in its proper space to be completely organized. To maximize on the space they have, homeowners are using a variety of storage accessories like turntables, bins, baskets, and pull-outs. These simple solutions are drastically maximizing space while still allowing homeowners to find everything quickly and efficiently. With new designs available through updated manufacturing techniques, people are choosing to update their kitchen countertops with quartz over granite. The variety of finishes has expanded to more natural stone looks giving quartz a competitive edge. Plus, it’s extremely durable and requires less maintenance than granite. In addition to organizing accessories, homeowners want the freedom and ability to move and add components so their pantry creates a more functional space. 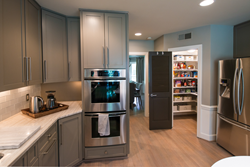 With freedomRail, homeowners can design a unique and adjustable pantry to suit their ever-changing needs. Kitchen technology is flooding the market and homeowners are eager to get their hands on it. From touch-censored faucets to refrigerators that tell you when your eggs are going bad, there’s something for everyone. Kitchens are getting smarter which is making life easier and allowing homeowners to be more organized. As trends come and go, having an accessible and organized pantry is always top of mind for homeowners and they are turning to freedomRail. With the flexibility to adjust their shelving to accommodate their busy lifestyle, freedomRail allows homeowners to easily maintain organization in the kitchen. To learn more about freedomRail and how it satisfies all your homeowner’s needs for adjustable storage, visit OrganizedLiving.com/freedomRail today. Organized Living brings superior storage and organization to the world through strong products, strong people, and strong brand, helping people organize their lives. From the closet to the kitchen to the garage, Organized Living offers high-quality, innovative storage and organization products that make everyday life easier and sells through professionally installing dealers, retailers, and online retailers. http://www.OrganizedLiving.com.